Cookie Witch Hats are the perfect solution when you are looking for a treat to bring to that Halloween party or special gift for your favorite ghoul or goblin. 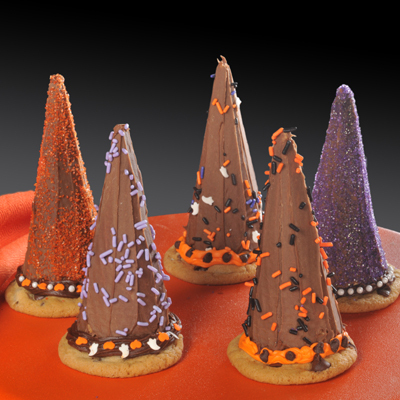 Using our refrigerated chocolate chip bar dough as the brim of this hat, sugar cones can be frosted, decorated and attached to make these deliciously cute cookie witch hats. LINE large baking sheet with sides with wax paper. With a small metal spatula or butter knife, spread a thin layer of frosting on each cone (Be sure to save some frosting to adhere cones to cookie hat base! About 3/4 cup will be needed.) Place frosted cones on baking sheet. Sprinkle with sugars and sprinkles. Let stand for 1 hour to allow frosting to set. MEANWHILE, PREPARE cookies as directed on package. Cool completely. FILL plastic bag with remaining icing; seal. Cut 1/4-inch corner from bag. Squeeze bag to pipe icing around bottom of each cone; adhere cones to each cookie to form hats. To decorate base of hat, use different colors of decorator icings and sprinkle with additional sugars or sprinkles.